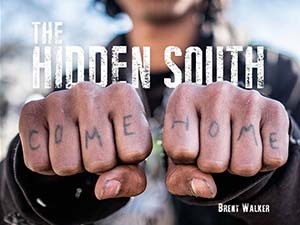 The Hidden South by Brent Walker is much more than a collection of pretty photographs. It is a grim visual documentation of the lives of those who live in a treacherous liminal area between two worlds. Walker began the project by wandering the streets of Atlanta, asking people to tell him about something that changed their lives. The project ultimately resulted in a stunningly beautiful collection of photos linked to short interviews of people from all around the south. We come into this world with a clean slate and are thrown into the waters of life. For some, the waters are clam and peaceful. But for others, they are turbulent and littered with the debris of a harsher reality. For those of us who find it too painful to survive on the surface, going under seems to be the only option, the only place where we can truly seek refuge. Many of us never return from the bottom (Walker). Walker’s photography is honest and totally unaffected by ego. He represents places and people without phony enhancements. His framing is exacting and well thought out. The portraits appear natural and un-posed. Even so, they create an extraordinary emotional connection between the subjects and the viewers. Each subject exudes an incongruous, ethereal beauty, the look of a fallen angel with broken wings. The Hidden South is a one-of-a-kind, mesmerizing, artistic creation with deep meaning and purpose. Viewers will be unable to turn away from the portraits, and hopefully, the next time they approach a fallen angel on the street, they will not turn away.